Kendra Scott’s entrepreneurial career was launched out of a spare bedroom in Austin, Texas. It was 2002, and Scott had just given birth. Bored and on bed rest, she withdrew $500 and bought the materials to make earrings. At this point, she’d been making jewelry as gifts for friends for years, as she was frustrated that the only available options at retailers were bookended by high-fashion, expensive pieces and trendy, low-quality pieces with nothing but blank space in between. Why not, she thought, go about filling the gap? “I put that first jewelry collection in a tea box, put my son in a baby Bjorn and we went store to store writing down orders,” Scott says. At the last store she visited, she had to sell her original samples in order to buy the materials to make the orders she’d just filled. During those early days, Scott sold her car and took out multiple personal loans, funneling the funds into her nascent business. These days “I sleep a lot better at night,” Scott says. At first, the business’s growth was continuous but slow. In 2008, Scott finally had the resources to design and cut a uniquely shaped stone: The Danielle earring, a large, distinctive slab, was born. Still one of the company’s best sellers, the earring, retailing at $60, was an instant hit. “It was the tipping point,” Scott says. Like other brand trademarks, such as the Tory Burch flat or the Longchamp nylon tote, the Danielle earring is instantly identifiable. It started showing up in magazines and on red carpets, worn by celebrity fans such as Mindy Kaling, Brooklyn Decker and Sofia Vergara. 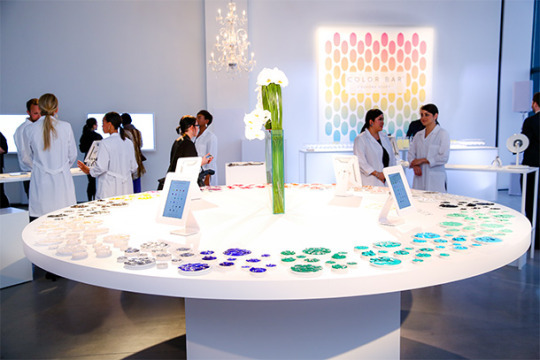 In 2010, Kendra Scott Design opened its first retail store in Austin, Texas. After that, growth accelerated rapidly: Revenue exploded from $1.7 million in 2010 to $24 million in 2013, while the number of locations grew from one to nine. Going from being the only employee to managing hundreds of people has been something of an education by fire: “Every day I wake up and I’m running a company bigger than it was the night before,” she says. From the beginning, Scott’s philosophy was to aggressively seek out advice from people she admired: “A lot of people think it’s a sign of weakness, but the greatest sign of strength is asking for help. And it’s a natural instinct for people to want to help other people.” She approached big names “thinking they would say no,” including Bill Fields, the former CEO of Walmart, with questions about manufacturing, and Cynthia Harris, the ex-head of Gap North America, for insight on selecting retail locations. Despite their status, both were generous with their time. Scott has worked hard to fill in her blind spots with smart hires. In 2010, with the company on the precipice of hockey-stick growth, she hired Lon Weingart who came with extensive retail experience, as her CFO despite pushback from the company’s HR director, who was concerned that they couldn’t afford him. She stopped paying herself, in order to bring Weingart onboard. Of course, as with any business, there have been missteps. In 2011, the company opened its third retail location on Rodeo Drive in Beverly Hills. “It was a vanity store,” Scott sighs. Despite a glitzy celebrity-filled opening party, there wasn’t enough sustained interest, and the store closed shortly thereafter. Now when selecting a new market, she makes the decision based on where her customers are, judging from online and wholesale purchases. The brand enjoys the most brand recognition in the South (particularly Texas, where 10 of its stores are located) but is slowly expanding outward, with stores launching in major markets such as Washington D.C., Chicago and Los Angeles. Scott is also considering a New York City location for 2016 but first she needs to get the word out to the East coast state, something she is working on. Eventually, Scott would like to apply her personal aesthetic and shopping philosophy beyond jewelry. In 2016, she plans on launching new products that will move the company towards becoming a bonafide lifestyle brand. In line with these grand ambitions, Scott just signed a new lease on a 43,000 square foot space in Austin for the company’s corporate headquarters. "Vogue meets Google" is the envisioned setup for the office, which translates to a sleek design plus tech-like perks such as free yoga and a juice and manicure bar. Beyond aesthetics, Scott wants the office to be inviting for babies and children; there will be a designated breast-pumping room, a TV nook reserved for cartoons and a wall dedicated to pictures of employees’ babies. She estimates that 95 percent of her corporate staff is female, many of whom have young children – and she never wants anyone to feel as if they need to choose between work and family life. If anything, Scott feels that her success proves the distinction between work and family life doesn’t need to so rigid. She wants to meet her employees’ families; she wants to meet their kids.